I’ve been critical of several Wisconsin decisions which, in my opinion, fail to recognize that the best interests of children is promoted by limiting conflict, including litigation between the parents. No Wisconsin court seems to recognize the importance of resolution. But the Texas Supreme Court does. In In re Stephanie Lee, No. 11–0732 (Sept. 27, 2013), the Texas Supreme Court reversed a trial court for rejecting a marital settlement agreement. 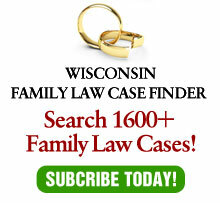 While the decision relied on a Texas statute that requires a court to accept such an agreement absent certain extreme circumstances (such as family violence), the language used by the court should be read by Wisconsin courts. The Texas Supreme Court found that the statute requiring courts to accept a settlement agreement reflects a policy that is well-supported by literature discussing the enormous emotional and financial costs of high-conflict custody litigation, including its harmful effect on children. The Texas court went on to note that it was respecting its legislature’s well-supported policy determination that courts should defer to the parties’ determinations regarding the best interest of their children when those decisions are made in the context of a statutorily-compliant marital settlement agreement. Contrast that holding with Frisch v. Henrichs, 2007 WI 102, where the Wisconsin Supreme Court held that a stipulation freezing child support was unenforceable because it was not in the best interests of the children and therefore contrary to public policy. See also Huhn v. Stuckmann, 2009 WI App 127, and Jalovec v. Jalovec, 2007 WI App 206. In these decisions, the courts don’t even give lip service to the objective of protecting children from their parents’ fighting. Rather, the courts equate best interests of the child with maximum financial support. In reality, once the child’s basic support needs are met, the interest of protecting the child from litigation should at least be considered. In fact, protecting the child should be the primary consideration. Worse, in Culligan v. Cindric, 2003 WI App 180, the Court of Appeals held that a portion of a divorce judgment that affected a prospective change in placement was invalid as a trial court could not order a change of placement that is contingent on the occurrence of some anticipated event. The court completely ignored the benefit to the child of allowing the parties to agree, subject to modification if circumstances change, on future placement without having to go back to court. This interest, which was not even discussed by the court, should have been primary instead of totally ignored. Obviously, the Texas Supreme Court has access to the extensive research involving the detrimental effects of litigation on children. Better yet, they applied that research to their decision. Of course, Wisconsin courts have the same access. I wish they would similarly apply it. Now clearly, the Texas high court probably found it somewhat easier to hold as it did because it had a statute to hang its hat upon. Lest anyone think I’m picking too much on the Wisconsin appellate courts, hey Wisconsin lawmakers, you could do something about this, too. Instead of the annual bill proposing mandatory equal placement – that never goes anywhere – how about one of you proposing a bill with language similar to the Texas statute? This one might actually pass – and do some good.